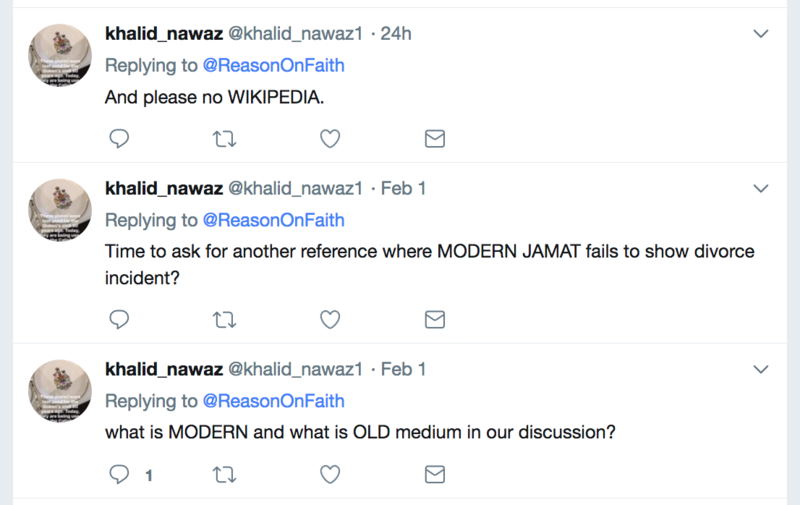 On February 1, 2018, Ahmadi Muslim Khalid Nawaz, who is active on social media and claims to be one of the editors or the wikipedia entry for ‘Mirza Ghulam Ahmad‘, decided to challenge me on my claim that modern Ahmadiyya literature downplays and avoids calling out that Mirza Ghulam Ahmad’s first marriage ended in a divorce. Having seen some former Ahmadi Muslims on Reddit call out that modern Ahmadiyya literature doesn’t acknowledge that Mirza Ghulam Ahmad had ever gotten a divorce, I looked into it. I knew older literature did state that Mirza Ghulam Ahmad had divorced his first wife—it was in the literature that I had grown up with. So I decided to take snapshots of those old books, before the evidence got scrubbed in “new editions” of the same. I shared a couple of tweets in this regard. The first source shown is more recent, published in 1978. Modern Ahmadiyya literature suggests that Mirza Ghulam Ahmad didn’t divorce his first wife; they were merely separated in lieu of a divorce. Earlier literature from the Community belies this claim. The next source goes back to a book first published in 1948. Here’s another piece of evidence that Mirza Ghulam Ahmad ultimately *divorced* his first wife, and it was precipitated by not getting his family’s support to marry the young Muhammadi Begum. From “Life of Ahmad”, p. 334. With these two references, we have established that at least 40 years ago (and prior) the Jama’at did publish material which clearly stated that Mirza Ghulam Ahmad had ultimately, divorced his first wife, Hurmat Bibi. To be clear, my contention is not that there is anything wrong with divorce. Yes, it’s undesirable. Yes, it’s unfortunate, and sometimes, also very necessary. It doesn’t make anyone less of a man or less of woman for realizing that their marriage is not conducive to living a happy and fulfilled life. It can be a necessity for the best of people. Sometimes, two good people are just not good for each other. My contention is not that Mirza Ghulam Ahmad cannot be a prophet of God because he got a divorce. The issue I have is that for whatever reason, modern Ahmadiyya Muslim literature seems to be trying to rewrite history by not mentioning his divorce. What’s next? Releasing revised versions of the older books so that they just ambiguously refer to Mirza Ghulam Ahmad having been ‘separated’ from his first wife? My issue is not the divorce itself. It is that this glossing over in modern Ahmadiyya literature should be alarming to those who value facts and integrity. That the Ahmadiyya Muslim Jama’at feels the need to change the narrative, and that they do it while seemingly religious believers in their Community do not even realize that Mirza Ghulam Ahmad was ever divorced, is troubling. It is evidence of the Jama’at’s ability to take a revisionist approach to history. My contention is that Ahmadiyyat doesn’t just play foul with its own history. They do this with Islam as a whole. But back to the divorce issue. We have Ahmadi Muslim mubaligh Khalid Nawaz on the case. First, Khalid Nawaz reveals that even he doesn’t think Mirza Ghulam Ahmad was ever divorced. That’s why he asks me for my source. Remember, this is a guy who proudly defends Ahmadiyyat on the Internet. This is a guy who claims to be one of the editors of the Wikipedia entry for ‘Mirza Ghulam Ahmad’. Here’s where Khalid states clearly, what he believes at the time. yes, I believe they were not divorced. Question: What does it matter if it was a divorce or a simple separation? Doubling down, he implies that I do not have the evidence. Clearly, he hasn’t read my tweets from earlier that day, as I’ve shown above, from Ahmadiyya Muslim literature. U have not shown me where it is written he (as) divorced the wife. I do want to commend him for being honest. Later, he will revise his view. We should all be so open to doing so, in the face of new evidence. Mirza Ghulam Ahmad married Humat Bibi when they were both young. The marriage wasn’t working, and they separated in lieu of getting a divorce immediately. They were on good terms, owing that they lived apart and didn’t really get in each other’s way. Eventually, the couple did get a divorce—as did Mirza Ghulam Ahmad’s own friends attest as cited in A.R. Dard’s “Life of Ahmad”. Now reread the Wikipedia extract in my tweet. Do you think this is a clear representation of the truth, or more of a lie through omission? If you search for “Hurmat Bibi”, you’ll find countless copies of this phrase on non-Jama’at websites who have parodied the “decided against a divorce” line. Ask yourself: when you read that line, do you think, “Oh yes, they eventually got a divorce”? The fact that more modern literature doesn’t state that Mirza Ghulam Ahmad divorced his first wife, speaks volumes of a carefully crafted revisionist arc in play. When it comes to religion and history, revisionism is rather distasteful. It distorts our ability to accurately assess facts and claims. Khalid eventually pieces it together. The couple was separated and then divorced. Yes, he (as) divorced her wife. And I see no issue with it? Does divorcing a wife makes you a lesser human? And since I never asserted I know of each fact of Ahmadiyya history which spans >125, your snide remark over my mistake is strange. At this stage, Khalid now takes the tack that Jama’at literate has been consistent all along. My claim is that recent Jama’at literature seems to downplay the divorce by omitting this detail. Khalid challenges me on this claim. Time to ask for another reference where MODERN JAMAT fails to show divorce incident? In his series of tweets with this one, Khalid asks me to define what constitutes ‘modern’ and what constitutes ‘old’. He also requests that I provide Jama’at sources, not Wikipedia. All in all, very reasonable asks. So, while in an earlier tweet I referred to the “last 10 years” as defining “modern”, I’m willing to extend that back to 20 years. What percentage of the literature that even mentions the words “Hurmat Bibi” also mentions that they were divorced, and not just separated? Let’s take a look. I first looked through the front page of alislam.org. Drilling down from there, I couldn’t see anything that was an obvious “history of Ahmadiyyat” or “biography of Mirza Ghulam Ahmad”. Such material exists in the “Library” section. A lot of those books are more than 20 years old. So I took a different tack. What would surface first when we search google, and restrict the results to the Jama’at’s official website, alislam.org? Below, are the first five results that come up, and which I explore next. The first result is addressed to children, so we’ll set that one aside. It doesn’t mention divorce or separation, but perhaps the author was trying to keep the history more “positive”. There is also no publish date visible on this online HTML book. Result 2: Article: Ahmadiyya History. Section: Prophecy about Muhammadi Begum – the truth! This article makes reference to the marriage having “broken down”. That’s about as close as we get to saying they were divorced that we’ll find in these first five results. “Broken down” is sufficiently ambiguous. It could also imply that “they were separated for a long time but not divorced”. There is also no publish date visible on this online HTML article either. Scroll down to see the section entitled, “First Marriage”. We read that the first marriage resulted in a “permanent separation”. Interesting choice of two words for what we have one word available to describe perfectly. This book used to be targeted at older children and young adults, so perhaps we’ll give this one a pass too. This book was first published in 1995, so even then, it’s outside of our “last 20 years” time frame. Even if we do grandfather it in by extending our timeframe, we still don’t find the word ‘divorced’ here. Further, it’s not like ‘divorce’ is a new word. It was used in Ahmadiyya Muslim literature in English in both 1948 and 1978. In 2018, the word ‘divorce’ is still part of our vocabulary. It’s not antiquated, like the word “chastise”. Here, we have a book which was first published in 2011, accessed as a PDF. It is published by Lajnah Imaillah UK. It is a tribute to Mirza Ghulam Ahmad’s second wife, Nusrat Jahan Begum. Page 12 tells us that Mirza Ghulam Ahmad and Hurmat Bibi had “practically separated by mutual consent”. Were they practically divorced or officially divorced? Separation is usually a precursor to divorce, but it is not necessary that separation always leads to divorce. Sometimes, a couple reconciles after a separation. Thus, using the word “separated” is misleading through omission. This result is a magazine, so there’s less expectation that it’s going to give us a chronological history. But what’s interesting is that there’s an anecdote relayed here on page 17 that includes Hurmat Bibi, who in addition to being Mirza Ghulam Ahmad’s first wife, was also his cousin. This is from the article within, The Divinely Inspired Guide. This magazine references Hurmat Bibi by name as Mirza Ghulam Ahmad’s first cousin. It did not mention, however, that she was also his first wife. Clearly, a Google search will give us some indication of popularity, but not necessarily the most recent biographical works. So, I now turn the challenge back over to you, Khalid Nawaz. Find us something originally written in the last 20 years (1998 – 2018, inclusive) which uses the actual word ‘divorce’ or ‘divorced’ in the context of Mirza Ghulam Ahmad and Hurmat Bibi. Show me something that does not leave it open to interpretation that perhaps they may have reconciled in the future, or that perhaps they stayed married, but just lived apart. I doubt you’ll find anything. But if you do, I suspect those findings from the last 20 years will form less than 10% of any of the books, articles, and magazines published by the Jama’at which even mention the name “Hurmat Bibi”. We’ll wait patiently as you do your search. A microblog is a place for more casual and usually much shorter content than typical blog posts. This section of my website is where I post content too long for Twitter and too off the cuff for the formal articles which I do write from time to time. You’ve probably landed here from a Twitter conversation. Often, there’s far more to say, and far too much more nuance required, than the 280 character limitation and even the platform, lends itself to. The content you’re looking at now, is one such post. Does “True Islam” Really Claim that there’s No Monopoly on Salvation? Why Focus on Islam if Christianity has More Adherents? Copyright © 2019 — Reason on Faith • All rights reserved.